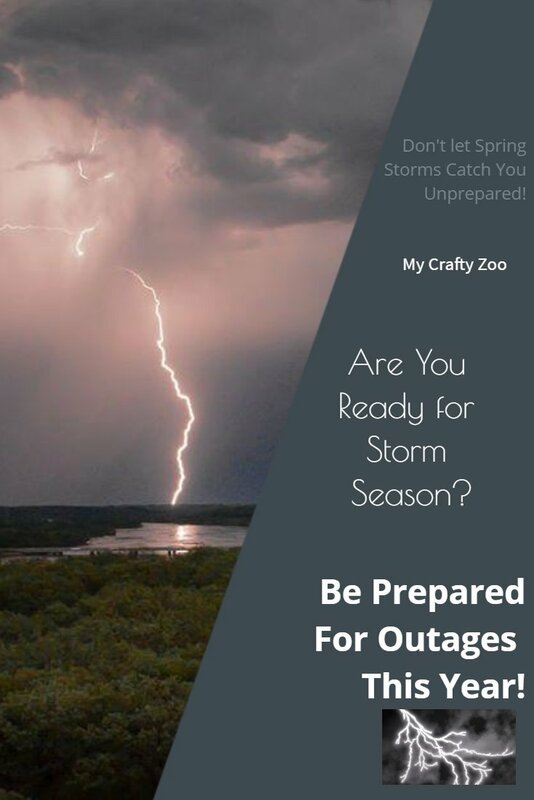 Power Outage can be a real pain, especially if you aren’t prepared! The 10 tips will help you be prepared so you can meet trial with triumph! 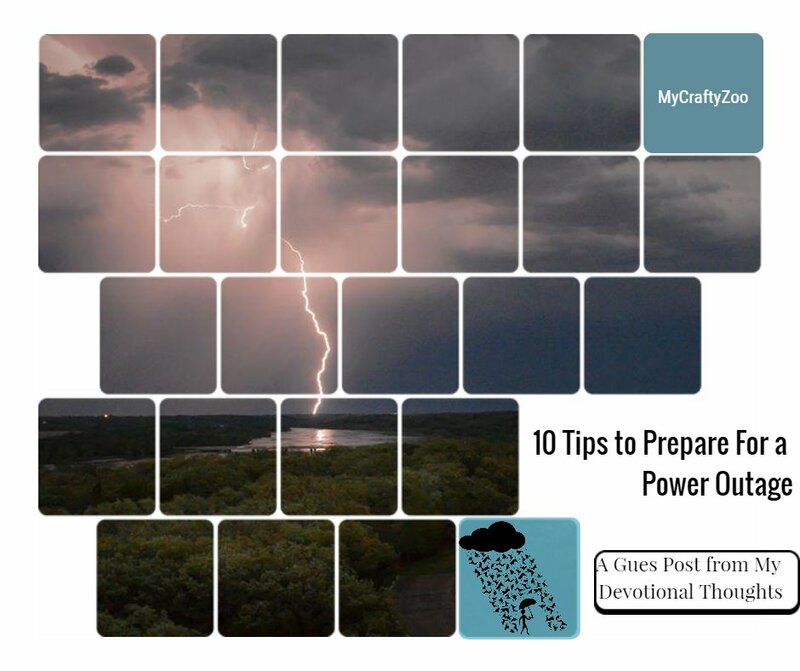 My name is Ruth Hill, and my blog is My Devotional Thoughts. I am a single mother with an active 8-year-old. We live with my parents and my best friend in Yelm, Washington. Though I’m a Tacoma, Washington native, but I’ve lived in Florida and Texas. Currently working as a substitute teacher, though I use to teach full time. Most of you have probably never heard of Yelm. We are most known for Ramtha’s School of Enlightenment (I’m not going to talk any more about that–you can look that one up yourself). Yelm is basically country living and is near the capital city of Washington–Olympia. We live on the outskirts of town and my parents have about 5 acres out here. We have had power outages before, but nothing that last more than a day, and that has even been rare. Generally they fix our power pretty quickly, which is nice. We have a wood-burning stove, and we do have a propane cooking stove. So we are set as far as that goes. One potential problem we run into is our toilets. We have a well, and when the power goes out, we only have a certain amount of water. Our toilets are high-powered and enclosed inner tank, We always remind everyone not to flush the toilets unless you have to. And we have never run out of water before. You may have heard of the big snow/ice storm that hit Seattle, Washington the week of Martin Luther King Jr. Day this year. Well, it hit us, too. Olympia was one of the hardest-hit areas, and all the area schools basically closed for the week. The snow was so nice and pretty, and I really couldn’t complain. I just stayed around the house blogging and watching TV. That was until early Thursday morning that week. I had just gone to the bathroom, and when I got back into bed as I started to drift off to sleep again, the power went out. I tried to sleep, but our alarm was going off. So I got up, and then I decided to call the power company. They said it would be back on by 7:30 A.M. No worries then. A few hours turned into a few days. Our power did not come on until the following Monday night. And did we ever learn a lot during that time! Well, at least I did. And I thought I would pass along what I have learned to you today. 1. Make sure you have a wood-burning stove in your house. I spoke to people all around who did not, and I do not know how they survived the ice storm. It was so cold. I can’t recall how much wood we went through. And that goes with this one–make sure you have lots of wood ready to burn. 3. If you have a well and a septic system and an enclosed tank (inner tank, that is), you can flush the toilet in a very unusual way during a power outage. Fill up a several gallon bucket with water/melted snow. Lift up the toilet seat, and pour the water swiftly down the toilet. You will appreciate this when your daughter says, “I have to do a stinky.” You don’t want that sitting in your toilet for too long! 4. Kerosene lamps are a life-saver as are LED flashlights. If your children are old enough, kerosene lamps really do help. Make sure you have lots of lamp oil. Also, when you are done for the evening, blow out the wick. Don’t turn the knob so it goes out unless you want to re-thread wicks! 5. A radio is essential. One that runs on batteries, that is. At least you will feel connected to the rest of the world. Thankfully, radios don’t use a lot of battery power, and you can last for about 2-3 days nonstop. 7. Don’t complain. It does you no good. Just deal with it. 8. Make sure you have lots of books on hand and a good LED flashlight or reading light. My mom actually read an entire book, and she never does that. 10. Make sure you have a way to keep your food from spoiling. This may be through the use of a generator (very expensive to operate), a friend’s fridge, or an ice chest. Try not to open the fridge unless you have to. When in doubt, throw the food out. Those are the lessons I learned. I am hoping not to have to employ these again any time soon, but I think we are better-prepared now! Thank you, Kaycee, for letting me post here today!